Blood testing measuring the blood’s ability to clot and the time taken for the same is known as coagulation testing. Clotting disorders can cause excessive bleeding or clotting and can thus be fatal in either scenario. Coagulation testing is ordered if the physician suspects clotting disorders. There are a number of bleeding disorders which are either acquired or inherited, the most common among them being hemophilia, blood factor deficiency, etc. The global market for coagulation testing was worth US$1,730 million in 2016, and is expected to exhibit a solid 9% CAGR in the 2017-2025 forecast period to end up at a valuation of US$3,715.8 million. Bleeding disorders can cause abnormal bleeding, therefore it is of the utmost importance to diagnose the disorders and monitor the coagulation status. The global coagulation testing market is witnessing significant growth due to growing prevalence of blood clotting disorders in many regions and the rise in cardiovascular disorders, which can also require regular coagulation testing. The global coagulation testing market is segmented on the basis of product type into instruments and consumables. Consumables accounted for over 80% of the global coagulation testing market in 2016. The segment is anticipated to dominate the coagulation testing market throughout the forecast period. On the basis of test type, the coagulation testing market is segmented into PT, APTT, TT, ACT, and others. The PT test segment accounted for the highest share, accounting for over 70% of the coagulation testing market in 2016. Based on end user, the global market is segmented into hospitals and clinics, diagnostic laboratories, home care settings and others. The diagnostic laboratories segment is anticipated to expand at a fast CAGR of close to 10% during the forecast period, while hospitals and clinics are likely to remain the leading contributor to the coagulation testing market. Geographically, North America and Europe are the major regions where revenue is derived from coagulation testing. The U.S., the U.K., and Germany show high adoption rates of coagulation testing instruments such as analyzers, POC testing PT monitors, etc. due to rise in awareness amongst people about the importance of detecting and monitoring their coagulation status, high prevalence of cardiovascular diseases, and the availability of a favorable reimbursement scenario. The coagulation testing market is likely to be valued at more than US$1 bn in both North America and Europe by 2025, with the two being valued at US$678.2 mn and US$569.2 mn in 2016, respectively. The coagulation testing market in Asia Pacific is said to be at a primary stage. It is anticipated that Asia Pacific will gain significant market share over the forecast period. Some of the key driving forces for coagulation testing market in emerging countries in the region are rising awareness, increasing population, entry of new players focusing on emerging markets, and increase in healthcare funding. 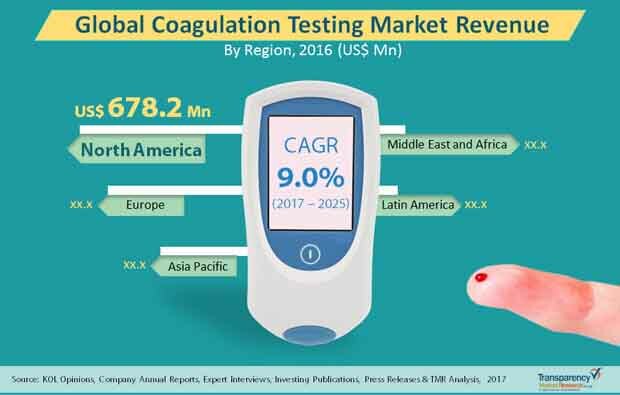 The Asia Pacific market for coagulation testing is expected to exhibit a robust 10.8% CAGR over the 2017-2025 forecast period, rising from a 2016 valuation of US$358.1 mn to US$891.8 mn by 2025. Some of the key players in the global coagulation testing market are Alere Inc., F. Hoffmann-La Roche Ltd., Abbott Laboratories, Siemens Healthineers, SYSMEX CORPORATION, Universal Biosensors, Inc., HemoSonics, LLC, and Helena Laboratories, Inc. Testing with high specificity and accuracy is likely to remain a major factor in the global coagulation testing market.